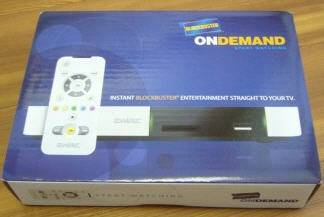 Blockbuster has joined the realm of movie streaming to the TV with the 2Wire MediaPoint Blockbuster Player. This past week Dave Zatz at ZatzNotFunny! tried out the new 2Wire OnDemand Player box with Blockbuster Movie Streaming built in. I'm not a huge fan of the separate box for every type of content, but still was curious about how this one performed versus the somewhat similary Roku/Netflix box. The device built by 2Wire doesn't require a Blockbuster subscription, costs $99 and for a limited time comes with 25 movie rentals. After that initial investment, the movies will be $1.99. I actually think there is a place for the VOD model with the newest releases compared to the Netflix subscription pay a set, monthly fee model with older releases. But Blockbuster is going to have to step it up if they plan to make it in this area. Amazon has a good jump on them and if Amazon does the right thing and expands their partnerships beyond Tivo, they could easily beat Blockbuster to the punch on this model. Dave had a lot to say about the player and in the end was left with a negative result. Still, it's worth a read for anyone interested in the Online Movie Distribution model. I think the best way to attack movie distribution directly to the television is via Blu-Ray players, extenders or other hardware devices that have multiple purposes. Netflix has already headed down this path with some success so its only a matter of time before BlockBuster moves this direction as well - as long as it makes it that far that is. Unboxing Photos and Comments at ZatzNotFunny! Read the full review at ZatzNotFunny! HDHomeRun Dual DVB-T Tuners Shipping Soon!